Search Providers are what you eventually will provide to the end users. The web site shows you links to download the specified Search Providers due to TAGs (either named or unnamed) from the configuration. If you are in the local administrators group of the server where the IT Search web application runs, you will see always ALL possible search providers and additionally a GOD MODE search provider. Regular users will only see Search Providers that aren’t in the named TAGs table, not limited to certain Active Directory groups or they are member of the group defined in the configuration of the named TAGs. The GOD MODE search provider is different then the regular search providers. It will do a search through all possible servers shares and not check for any end user permissions, meaning it will show what ever the application pool user is able to see (what should be everything if you configured it right) and report this very quickly back. This is specifically helpful if a user is looking for a specific information and asks e.g. the IT department for help – this often happens during audits but also in the regular daily business. You further should know, though only members of the administrators group of the server where the IT Search web application is executed will see the GOD MODE search provider, you still can download and provider the Search Provider file to any end user. They will get the exact same results, but of course due to NTFS permissions / ACLs will only be able to access what they have access to. It is not to recommend to provide this to the end user, but there might be situations where this could be helpful. If you now wonder if you have to provide the URL to the IT Search web applications to the end users, the answer is no. You can, but you don’t have too. The web site allows you eventually only to download the configuration file for Windows. Those files could be made directly available to the end users or even being rolled out per GPO. Further details about this can be found in the Microsoft article Deploying Search Connectors in Windows Federated Search. 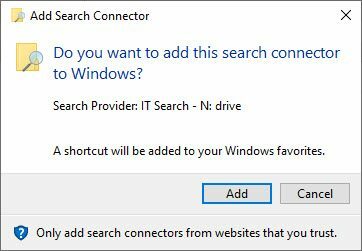 Eventually the end user will open the search provider file and the first time he does so Windows will ask if this search connector should be added to the profile. This is a question per Search Provider file. Those providers can be added end removed by the end user. Once this is added you can right click the search provider in the shown path in Windows Explorer and add it to the Start Menu, put a link on the Desktop etc.pp. – this helps to quickly access the installed search in Windows Explorer (cause they are a little bit hidden), or you just have the user open the Search Provider configuration file over and over again what would lead to the same result. While in Windows Explorer on the target search provider, you can now simply type a search keyword in to the right upper search box in Windows Explorer and wait for the results. The IT Search web application will be contacted and process the request, answering every single positive result as quickly as possible back to the client. If not in GOD MODE the end user will only get results he has access to due to NTFS file permissions.